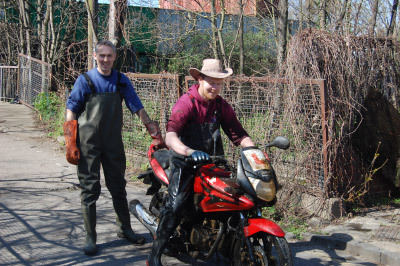 The team pulled 9 motorbikes from the river - as well as the usual selection of shopping trolleys and pushchairs. The Mayor of Wandsworth, and the Lady Mayoress visited the team to wish them luck with the clean-up. 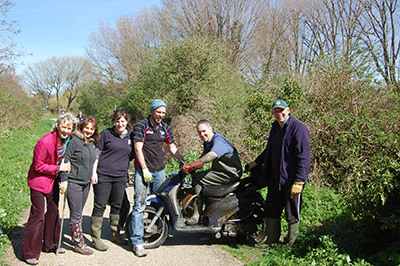 The Wandle Trust hosts river clean-ups every second Sunday of the month. For the last two years Seymour Green has supported these clean-ups by providing equipment and covering associated costs. 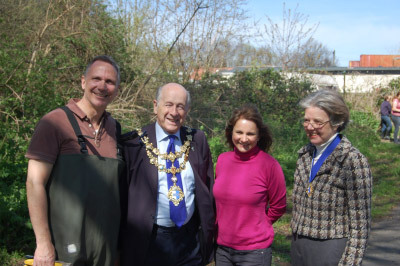 Furthermore Colin and Adele Brown, Directors of Seymour Green, also join the clean-up and get 'down and dirty' helping to clean the river. In March, when the clean-up was in Poulter Park, volunteers found over 200 tyres in the river. On Sunday April 12th, from 11am, the volunteers headed to Trewint Street, Earlsfield to clear the Wandle once again. Last year at this location the team found: a motorbike, a sofa, two washing machines, a wood burning stove and 50 bags of other junk and rubbish. This year was a record year - with even more rubbish being pulled from the river. "Our clean-ups rely on external funding, and we are very grateful to Adele and Seymour Green Estate Agents for supporting this event, as well as the Living Wandle Landscape Partnership funded by the National Lottery Heritage Lottery Fund." said Polly Bryant, Project Officer (Volunteer Support) at The Wandle Trust/South East Rivers Trust. The Wandle Trust provides waders, protective gloves and First Aid facilities, but please bring your own wellies if you have them, and wear old clothes that you don't mind getting dirty and possibly wet. 'We thoroughly enjoy supporting the Wandle River clean-ups twice a year because each time we attend and get involved something different is pulled from the river, last time it was an eel in a suitcase! We also believe it's an excellent local community event for our staff to engage in and to appreciate the importance of helping to give back.' explained Adele at Seymour Green. New volunteers are always welcome. Please see www.wandletrust.org for details. The Wandle Trust is part of the South East Rivers Trust, an environmental charity dedicated to the restoration and conservation of rivers and their catchments in the south east of England. Within London, the South East Rivers Trust look after the Wandle, Hogsmill and Beverley Brook. For more information visit www.southeastriverstrust.org or call 0845 092 0110. Details of the cleanup events can be found on www.wandletrust.org on the calendar tab.